When my heart began to fail and my physicians told me that I needed to prepare myself for dying, I searched everywhere for manuals, guidebooks that would help me to do that. I was an academic, and the way I approached everything in my life was through research; why would my dying be any different? I found medical volumes, which described processes of aging and various terminal illnesses; I also discovered religious publications that sought to explain what happens after death. But I was devastated by the lack of any volumes that could walk me through the changes I was experiencing spiritually and psychologically. I longed for just one book to connect me with another person through this experience of dying. Seventeen years later, there is a whole genre of writings called death and dying memoirs — books that chronicle someone’s journey with terminal illness from the first-person perspective. 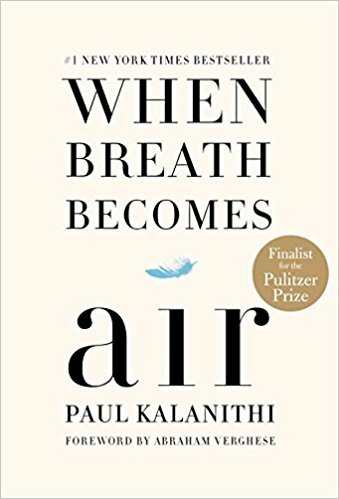 And the best of these is Paul Kalanithi’s When Breath Becomes Air, published in 2016. Amongst all memoirs related to illness and death, this is the volume that most intimately connects me with another person through this experience of dying. In his last years of neurosurgery residency at Stanford University, at the age of thirty-six, Kalanithi was diagnosed with metastasized lung cancer. His bestselling volume explores some of the most challenging to convey yet significant aspects of the dying process, including making meaning at the end of life, the function and experience of time for the dying, and relating to loved ones as death nears. We read of his last day as a surgeon and his first days as a father. Beautifully written and profoundly insightful, these essays, some initially published in newspapers and journals, unite his surgical precision of observation with his deeply moving capacity to convey his interior world through the lens of his dying. And these questions stay with the reader long after the book is closed. The word “doctor” derives from docere, the Latin verb “to teach”. With When Breath Becomes Air, Paul Kalanithi will continue his work as a doctor long after his breath became air.